28th March 2016 was the day when students of class V rejoiced in the happiness of successfully completing their academic session 2015-16. 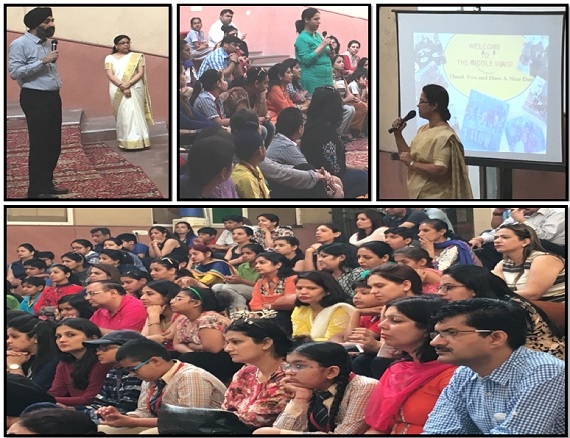 The proud parents of the little ones were invited for an orientation program where they were explained and were given an in depth account of the CCE (Continuous and Comprehensive Evaluation) system and examination pattern which is a step taken by CBSE in order to improve the student’s performance through a detailed Power Point presentation by the Class Coordinator Ms. Sanchayita K. Later the Middle Wing Coordinator, Ms. Lekha Prakash, very coherently resolved all the doubts and queries that the parents had. The orientation was made extremely interactive and fruitful when the parents were encouraged to share their views with respect to the new academic year 2016-17. The parents and students left the venue thoroughly content and excited at the same time.